Dual bands of ultraviolet light mark streams of plasma circling Earth's equator. Credit: NASA IMAGE Satellite/University of California Berkeley. Although the general premise is probably thousands of years old—that Earth is somehow an electrical entity—it has only been in the last 100 years that scientists have given serious credence to the possibility that we could be living in a dynamic Solar System where electricity plays an important role. 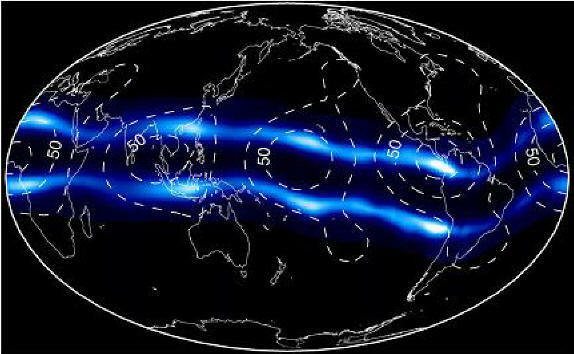 Earth's polar aurorae are further evidence of this connection, as are high-altitude discharges known as red sprites and blue jets. Sprites and jets carry charge distribution from lower atmospheric layers into the ionosphere. They are usually seen high above thunderstorms, so high that the storm is sometimes below the horizon when the phenomenon occurs. Space shuttle flights have recorded the glow from sprites and jets as they launched upward toward space. They are essentially reverse lightning bolts—beginning as powerful upward strokes that rapidly diminish into small filaments—and seem to be closing the circuit between the cloud tops and the ionosphere. The electric charges flowing out of the Sun, on the other hand, travel down magnetic flux tubes that have also recently been discovered. These "magnetic tornadoes" are several kilometers wide and allow electric currents to flow directly from the Sun into the polar regions, generating visible light, radio waves, and x-rays. 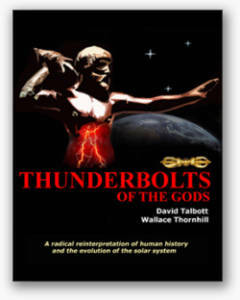 The power generated by an auroral substorm is far greater than what human beings can create with every coal-burning, oil-fired, or water-driven means combined. These currents are comprised of widely separated, low density charged particles and are called Birkeland currents. Despite the low current density, the volume of charge is so great that there is an extremely high overall current flow, over a million amps. It is common among planetary scientists to talk about plasma, but to do so in a way that makes its electrical nature seem to be of little import. 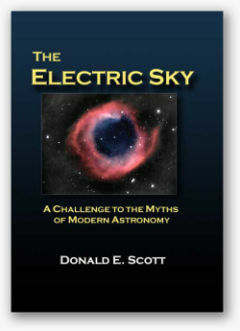 Solar "wind," "a rain" of charged particles, ionic "impacts," "clouds of ionized gas": such terms are meant to convey the inertial aspects of plasma and reduce it to nothing more than hot gas and dust. Because astrophysicists are convinced that electricity is not a factor when dealing with objects in space, the fact that plasma can act with forces 39 orders of magnitude greater then gravity is virtually ignored. Every world in the solar system is a charged body orbiting in a plasma. There are many ways in which plasma interacts with dust or atmospheric gases no matter how hot or cold they are. Spacecraft sent to other planets, as well as satellites orbiting our own planet, have detected aurorae, lightning, tornadoes and dust devils. Large magnetic fields have been detected in galaxies, and those fields indicate that Birkeland currents flow in circuits through them. The current-induced magnetic forces pull the currents into filaments, twist the filaments around each other, and then "pinch" the galactic plasma until the internal pressure balances the magnetic constriction. Stars will form like beads along a galactic wire, that wire being a Birkeland current filament. Volcanoes on Earth have been found to “spit lightning” from their vents. Global dust storms on Mars are shown to be fed by thousands of sky-high funnels. Further into the solar system remote instruments are finding radio noise, electrified comets, spokes in Saturn’s rings and many other modes of electrical activity. It is rare to read a report in a science news magazine that discusses the electrical nature of plasma and its role in the Universe. 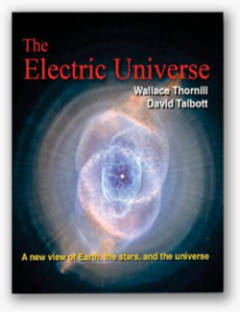 As more instruments capable of measuring the plasma environment of space are built and more sensitive detectors are sent out to the various planets, moons, comets, and eventually, nebulae, the Electric Universe paradigm will only gain more support. And that is not hot gas.